Maize has become a staple food in many parts of the world, with the total production of maize surpassing that of wheat or rice. However, little of this maize is consumed directly by humans: most is used for corn ethanol, animal feed and other, such as corn starch and corn syrup. 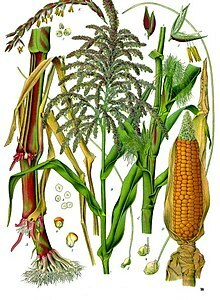 The six major types of maize are dent corn, flint corn, pod corn, popcorn, flour corn, and sweet corn. High-maltose corn syrup is a food additive used as a sweetener and preservative. The majority sugar is maltose. It is less sweet than high-fructose corn syrup and contains little to no fructose. It is sweet enough to be useful as a sweetener in commercial food production, however. To be given the label "high", the syrup must contain at least 50% maltose. Typically, it contains 40–50% maltose, though some have as high as 70%. High-fructose corn syrup (HFCS), also known as glucose-fructose, isoglucose and glucose-fructose syrup, is a sweetener made from corn starch. As in the production of conventional corn syrup, the starch is broken down into glucose by enzymes. To make HFCS, the corn syrup is further processed by glucose isomerase to convert some of its glucose into fructose. HFCS was first marketed in the early 1970s by the Clinton Corn Processing Company, together with the Japanese Agency of Industrial Science and Technology where the enzyme was discovered in 1965. 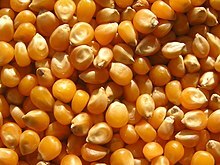 Samp is a South African food consisting of dried corn kernels that have been stamped and chopped until broken but not as fine as Mealie-meal or mielie rice. The coating around the kernel loosens and is removed during the pounding and stamping process. It is used in the Xhosa variant of Umngqusho and sometimes eaten with Chakalaka. 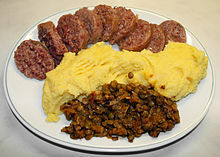 It can also be served with beef, lamb, poultry and in stuffings. According to the American Heritage dictionary (4th edition), "samp" is of Native American origin, coming from the Narragansett word "nasàump." 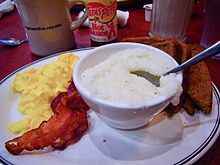 New Englanders since early colonial times have referred to cornmeal mush or cereal as "samp." ... that the bluegrass billbug feeds on maize and other grain crops as well as on Kentucky bluegrass? For editor resources and to collaborate with other editors on improving Wikipedia's Maize-related articles, see WikiProject Food and drink. Do you have a question about Maize that you can't find the answer to?